A routine City Council meeting in Mobile, Alabama, took an unexpected turn in April when John C. Young stepped up to the lectern. 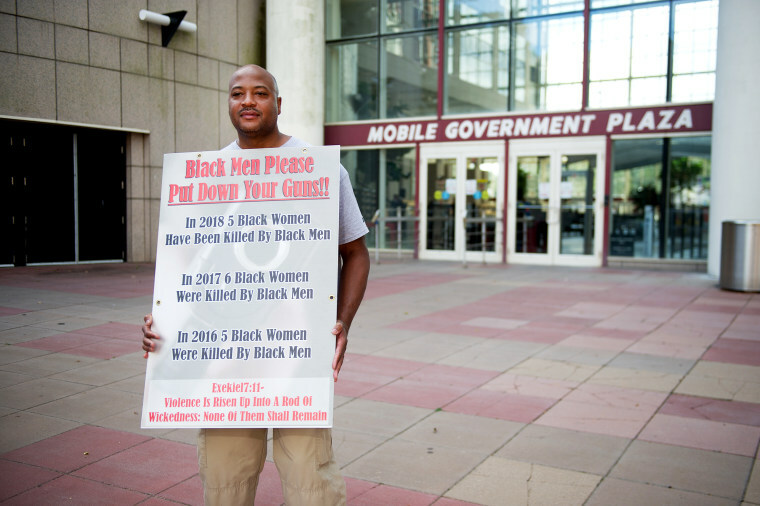 Speaking solely as a private citizen, not as a police sergeant with 26 years of law enforcement experience, Young leaned into the microphone and delivered a heartfelt plea: City leaders need to do something to stem the high number of black women in Mobile being killed in domestic violence incidents. Five black women were killed in 2016, six in 2017 and five by April this year — 16 women dead, mostly at the hands of black men, over three years — Young told the council. "And no one said a word about it," Young recently told NBC News in an interview. Young, 47, who asked the seven-member council to commission a local university to study the issue, says that the killings have been virtually ignored in Mobile. He said there was more media coverage given to the 2016 death of Michael Moore, a black teenager who was fatally shot in Mobile by a white police officer after a traffic stop. His death led to protests and marches by the city’s black community. According to Bureau of Justice statistics, black women are 35 percent more likely to be victimized by domestic violence than white women and four times more likely than white women to be killed by a boyfriend or girlfriend. An analysis by the Centers for Disease Control and Prevention found that black women's overall homicides rates in the U.S. are higher than women of any other race or ethnicity. Such responses, he said, contributes to the black community's silence on domestic violence. Sa'iyda Shabazz, a Los Angeles-based social commentator and writer, tells NBC News domestic violence within the black community deserves attention, but it shouldn't be considered only a black problem. Justice Department data shows the rates of total violent crime where the victims and offenders are the same race are higher than when they are not. Shabazz says that longstanding racist stereotypes, particularly the narrative that black men are more threatening or violent than men of other races, is contributing to the silence on the issue among members of the black community, especially black women. The lack of response, he insists, is frustrating. “They could have brought attention to black women being murdered by black men and they didn't,” he added. Representatives for the city of Mobile did not respond to requests for comment. Media reports of Young’s presentation said three council members responded publicly, with one, C.J Small, being quoted as saying: "It's going to take more than just the seven of us. It's also going to take the administration. It's also going to take the citizens of Mobile, the community at large." Council Vice President Levon Manzie reportedly told Young that counseling services and the support of churches are needed to address the issue, along with “the help of the older generations in our community." Young says he has no plans to stop his crusade; since his presentation he has hosted “prayer walks” with Mobile-area churches and spoken to civic, educational and religious groups across Alabama. He says it is the least he can do to honor the lives of the black women who’ve paid the ultimate price. NBCBLK contributor Chandra Thomas Whitfield reported this piece with support from the Fund for Investigative Journalism and the Schuster Institute for Investigative Journalism at Brandeis University Fellowship program.